Let’s get one thing straight: SEO is not a walk in the park. It’s an aspect of digital marketing where almost all other areas converge — from content marketing, website optimization, UX design, and even cybersecurity. However, the complicated nature of SEO is only part of the reason why many brands struggle to attain high search engine rankings. It’s also the fact that the SEO landscape can be brutally competitive, especially in popular niches. A local search marketing campaign could be your ticket to the top positions on Google, especially if you’re in a somewhat saturated niche. What’s that — you don’t know what local search marketing is? Without further ado, let’s talk about what local search marketing really is and how to leverage it for higher rankings. 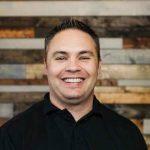 By now, you should already know a couple of workarounds to avoid competing with brands out of your league. 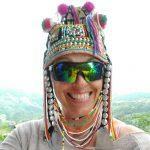 You are, after all, reading the Long Tail Pro blog. There’s a pretty good chance you already know that targeting long-tail keywords is a reliable way to slice through the competition. To cut to the chase, long-tail keywords in SEO allow you to cast a narrow net and draw in users who are more likely to turn into customers. It also means you’ll avoid vague, generic terms that may be extremely difficult to rank for. Local SEO marketing pretty much accomplishes the exact same things. Instead of targeting the wide, international audience, local SEO means refining your target audience to only the areas that you physically serve. For example, suppose you run an organic pet store in Denver. The first thing you’ll notice is the map-based results found at the very top of the page. Marketers call this the “Google Local Pack,” and to them, that is the checkered finish line. Be patient — you’ll get there. For now, you still have quite a few things to learn before you can launch a successful local SEO campaign. Now that you have a basic understanding of local SEO, let’s take a quick gander at its benefits. It’s no secret that mobile devices have permeated almost every aspect of our lives — even the way we search the internet for information. Data from Statista shows that mobile devices account for well over half of all organic search traffic. 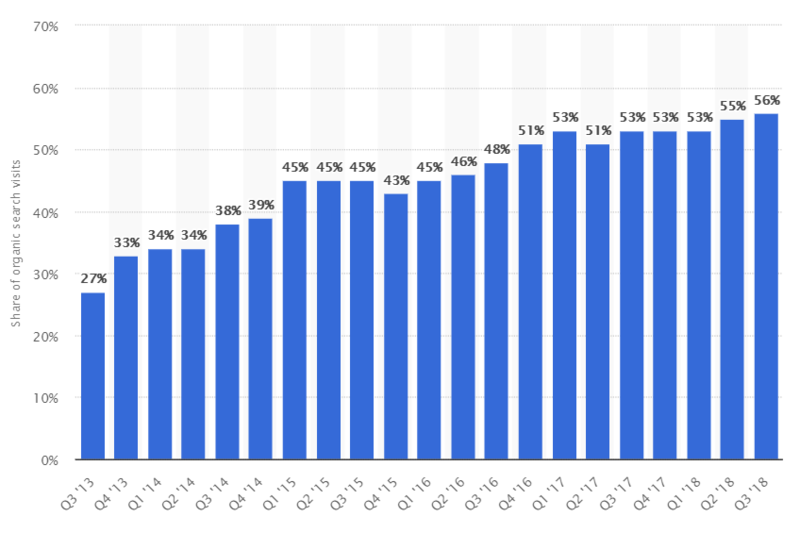 To be more specific, the mobile share of organic search visits jumped to 56 percent in Q4 2018 from 53 percent in Q4 2017. What does this have to do with local SEO? 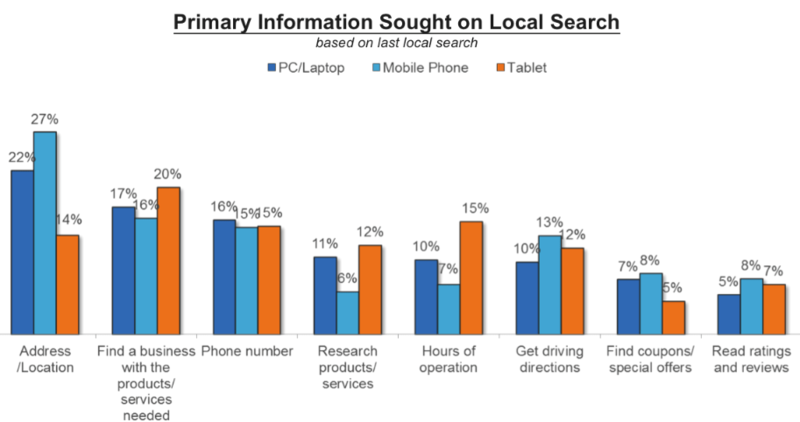 Simple — it just so happens that mobile internet users are very likely to perform local searches on their phones. One survey reveals that 82 percent of mobile users perform searches with “near me” plugged in at the end of their keywords. As you may have guessed, a “near me” search utilizes the user’s location to find businesses close to them. This makes sense for users who need a service or product — and need it quick. They won’t mess around with businesses from distant locations and will instead head straight to companies they can visit firsthand. Imagine a customer who urgently needs the solutions your company offers. With the right local search marketing strategy, your brand could be front and center — just when they’re absolutely ready for a transaction. Whether or not the user types in “near me” on their search query, local searches historically have higher conversion rates. Put yourself in the audience’s shoes. If you have a problem and know where to get the solution, there’s really no excuse for you not to. But don’t take my word for it — according to a study by Google, 50 percent of users who performed a local search on their phone visited the store within a day, and 34 percent of local searchers on their personal computer or tablet did the same. That’s 84 percent of people who performed local searches entering your store within 24 hours. Out of those who used their phones, 18 percent went ahead and made a purchase. The rest, on the other hand, should and will remember your brand whenever they’re finally ready to take action. This leads us to the next benefit of having an effective local SEO strategy. Numerous studies have dissected the different types of user intent behind local searches. Unsurprisingly, most users are driven to learn more about nearby companies that offer the product or service they require. The leading intent is to learn the address or exact location of a specific business, followed by the desire to look for alternative brands and their contact numbers. Other reasons include researching products and services, learning about the establishment’s open hours, and getting driving directions. Lastly, running local SEO campaigns can be considered as the easiest way to attain high search engine rankings and supercharge your site with more traffic. This is due to a couple of reasons. 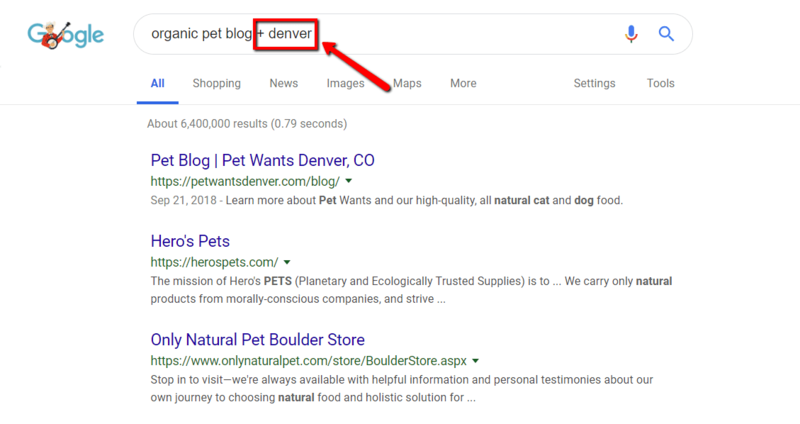 First off, your keyword research efforts are made simpler since you already know how to sieve out the long-tail variations you have to target. Sure, the fine details of keyword research are still there. 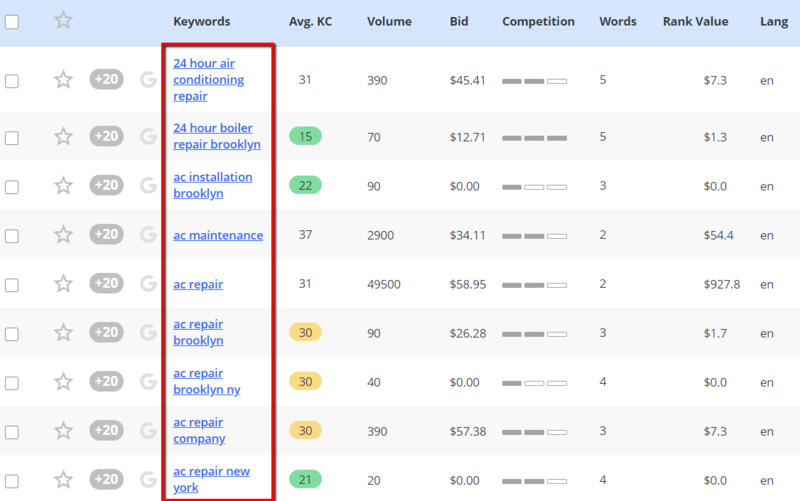 You still need to pay attention to keyword competitiveness, monthly search volumes, average cost-per-click, and so on. But at the end of the day, you already know the terms that must be included in your target keywords — namely the terms “near me” and the name of your location. Search engines like Google also have your back when it comes to the tools that can help you reach the local pack. You definitely could use a boost from premium tools, but even with them under your belt, your local SEO campaign shouldn’t break your bank. Since you’re reading this post, it’s safe to assume you already have a registered, physical business address. Of course, you should also display all the other pieces of information that your target audience want to see — from your contact number to your establishment’s store hours. 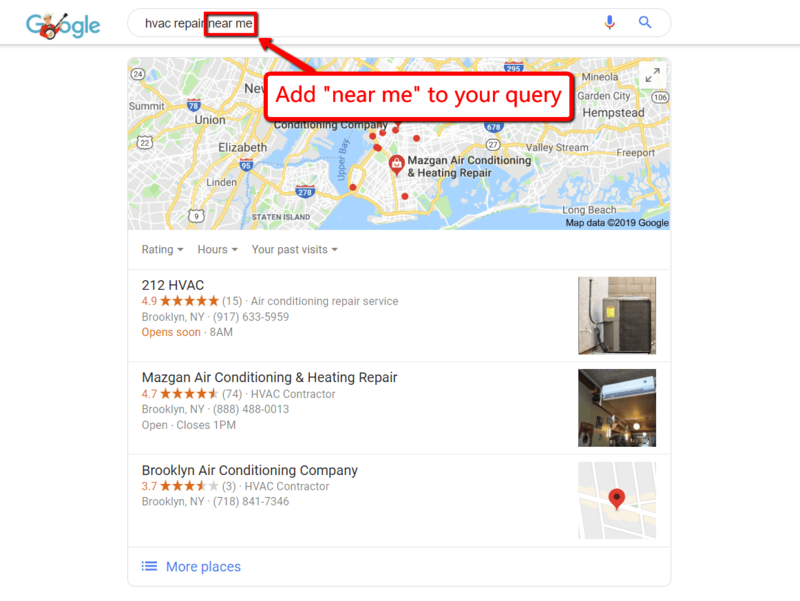 The next step is to prepare a structured data markup that will help search engines pick up your business location as well as other valuable information. If you don’t know what this is, you can refer to this post for more information on structured data and its most common implementations. 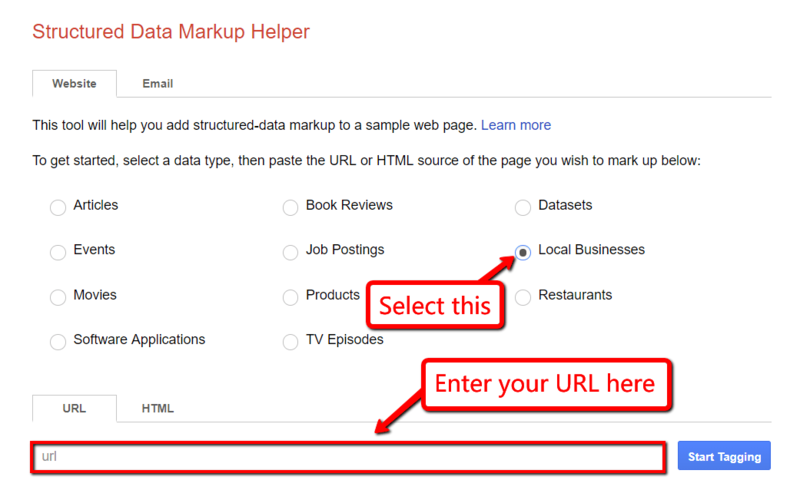 Don’t worry — it all only sounds technical, but it’s actually easy with the Google Structured Data Markup Helper tool. It works by automatically generating a ready-to-use structured data markup for your website. What happens next is the tagging process, which involves highlighting key text elements on your page and assigning them to your structured data items. To verify if you tagged the right information, look at “My Data Items” and check whether or not the right data is inserted. While you’re here, try to tag as many data items as you can, including your state, country, locality, opening time, and your contact details. When done, go ahead and click “Create HTML” to generate the code you need to paste to your website. Aside from SDMH, another tool that Google offers to help with local SEO is My Business. Keep in mind that local SEO success heavily relies on a consistent NAPU — Name, Address, Phone Number, and URL. Comprehensive structured data embedded in your website is a step in the right direction. But to really help search engines take note of your NAPU, you should also register your business details on high-profile directories like My Business. To do this, head to the My Business homepage and sign in to your official Google account. My Business will then load up a step-by-step configuration process wherein you must supply the information requested. This includes your business name, street address, state, and so on. 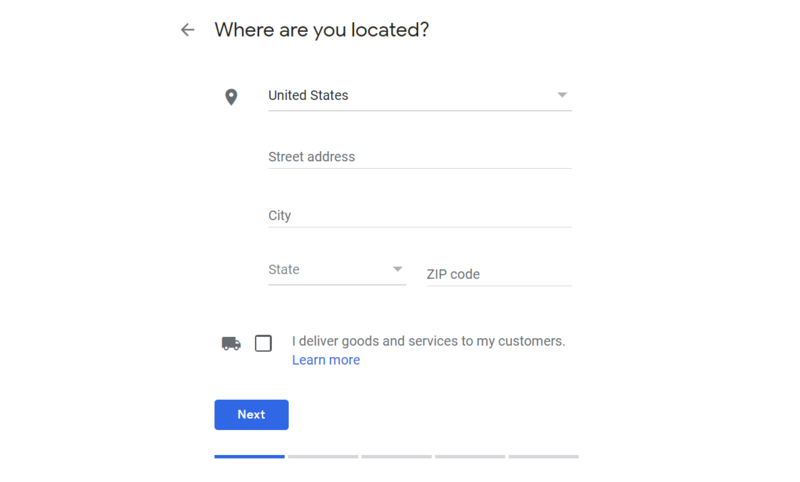 To verify your business location, Google will send a postcard to the address you registered. This contains a verification code that you must enter into My Business. Whatever you do, be sure to accurately submit all information to online directories. Aside from Google My Business, some other places you can enlist your business includes Yelp, Facebook, and Bing Places for Business. If you have the slightest experience with SEO, you must be anticipating the step where we create the obligatory SEO-friendly content. But before you get to that, you must first look for the local keywords you’ll use. Here’s where we fire up our favorite keyword research tool, Long Tail Pro. As always, you just need to supply a new project with a seed keyword that best describes your business. Upon clicking “Retrieve,” it should only take Long Tail Pro a few seconds to generate long-tail keyword variations based on your preferences. That’s when you can start looking for local keywords you can use in your campaign. 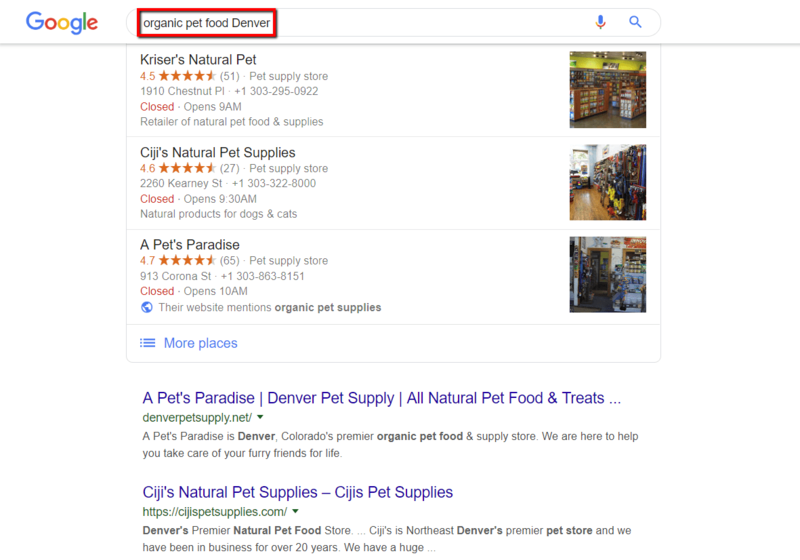 A straightforward trick is to create a filter that includes keywords with the phrase “near me,” which normally yields around two or more long-tail variations of your seed keyword. You can also expand seed keywords that contain the name of your location for a more diverse lineup. In relation to the example above, you can try “HVAC repair Brooklyn” to see if there are new suggestions. Don’t forget that you need to pick keyword variations that have an average keyword competitiveness rating that matches your website’s ranking potential. You can calibrate the suggested KC by connecting your domain to your Long Tail Pro project. Finally, it’s time for some good, old-fashioned link building to accelerate the results of your local SEO campaign. Bear in mind that link building for local SEO isn’t fundamentally different from that of regular SEO. The only significant nuance is that you’ll be focusing on websites that also target your local audience as your potential link sources. For example, if your preferred method of looking for potential link sources is through Google, you just need to include a specific location name. Using the plus operator (+) is a great way to attach the location to your query. Of course, there’s no guarantee that you’ll find willing link sources in one go. You probably have to switch things up with different keywords, like “forums,” “online community,” “guest post,” and so on to spot local sites that can provide you with precious backlinks. Local SEO could be the key to higher search engine rankings for your business. 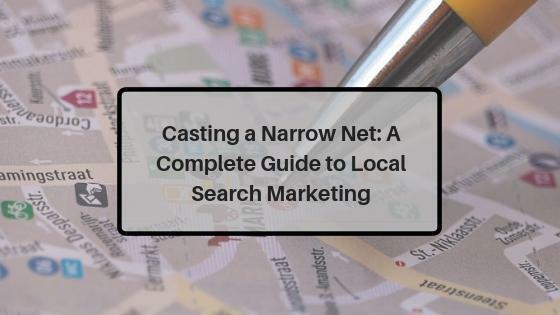 Local SEO casts an even narrower net than targeting long-tail keywords. 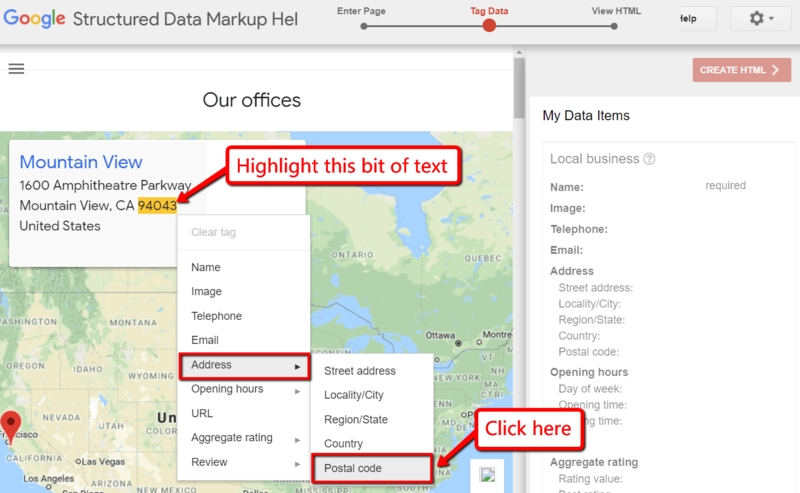 Use structured data to help search engines assimilate your business address. Submit your business information to online directories like Google My Business for greater searchability. Target local keywords to attract the right kind of traffic. Promote your website to local blogs, forums, and other content publications. A decade ago New York Times author Thomas Friedman made a fortune telling us that the world was flat and we’d have to compete globally. Now it looks like he was wrong. I’ll be implementing the ideas described in this article ASAP!